Published: July 1, 2013 Updated: July 2, 2013 1:15 p.m.
Simon Wiesenthal Center honors former Stanton mayor for his role in documenting concentration camp. LOS ANGELES – Former Stanton Mayor Edward D. Royce, whose photographs of corpses at the Dachau concentration camp have long served as rebuttal to Holocaust deniers, was honored Monday with the Simon Wiesenthal Center's Distinguished Service Award for his role in helping liberate the camp when he was an Army private. 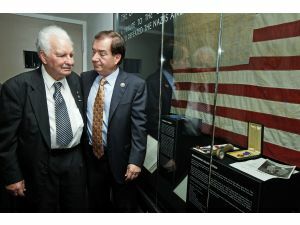 Rep. Ed Royce, R-Fullerton, right, with his 88-year-old father, Ed Royce Sr., a World War II veteran, look at memorabilia from World War II, during a honoring ceremony for Royce Sr. with a Distinguished Service Award at the Simon Wiesenthal Center in Los Angeles. "I saw heaps of clothes in front of the building with bad – German for bath – painted on the door, the shower heads that pumped deadly gas instead of water, the room filled halfway to the ceiling with naked bodies and the room with ovens for burning the bodies," said Royce, 88. "There was an entire trainload – hundreds of emaciated bodies – on a nearby rail spur. Evidently they had starved to death on the train." Royce's black-and-white photos, taken with a camera borrowed from his brother, documented the ovens and corpses at the camp. An estimated 6 million Jews were killed during World War II, and an estimated 30,000 prisoners died at Dachau, including deaths from extermination, disease, starvation and suicide. Among the 50 or so people on hand at the Los Angeles museum for the ceremony were two Dachau survivors, Albert Rosa and Morris Price. Before the event, Price recounted the arrival of American troops at the camp and the possibility he'd seen Royce. "Whether it was him I saw or somebody like him, it was a happy sight," said Price, a native of Poland who is now 87 and lives in Los Angeles. "We knew the American Army was close – we just didn't know if we'd still be alive when they got there." Dachau, opened in 1933 to hold political prisoners, was the first German concentration camp. Those paying tribute to Royce Monday included Rabbi Marvin Hier, founder of the Wiesenthal Center. "Today we honor an ordinary GI who, like hundreds of thousands of others, risked their lives for the future of others," said Hier, whose center, in turn, honors the concentration camp survivor and Nazi hunter Simon Wiesenthal. Also taking the podium was Royce's son, Rep. Ed R. Royce of Fullerton, who talked about how his father's memories of Dachau helped shape his world view. "When you look at the photographs, you begin to get a sense of the atrocity people are capable of when they're incited to do so," the younger Royce said. "They nearly liquidated an entire race of people." Royce, chairman of the House Foreign Relations Committee, also warned that anti-Semitism was still alive, particularly in Iran, and called for support of a bill he's authored that would increase efforts to block that country from building nuclear weapons.